There was a way to do this properly, DC, and this wasn't it. Yeesh. Honestly, though, is there anyone out there who thinks Ray Palmer is actually more interesting than Ryan Choi? Because unless you're talking about the version of Ray that John C. McGinley voiced on Justice League Unlimited, or the one that dressed like a barbarian, rode around on a frog, and bedded a diminutive yellow alien princess, you're wrong. I'm big on racial politics and the need for non-white characters to play a major role in comic book universes. I'm also opposed to handing out token memberships to minorities via dubious legacies. The latter rarely works out as well as a Mr. Terrific, who has completely outshone his namesake. In the case of Ryan Choi, between his overemphasized features on his debut issue and his being a shrinking Asian, put me off immediately. Further, I have a great deal of affection for Ray Palmer, who created his own suit and powers, rather than having them handed to him and still manage to ruin a classic costume in the transition. I have nothing personally against Choi, but I also never had much for him, and with the reinstatement of Palmer he seemed doomed to second class status anyway. Whether through entirely new identities or redeeming legacies, I'd like to see more characters of color in comics. I'm just less interested in the conflict that comes from taking a dump on established heroes (death, madness, etc.) to build up these legacies, or setting someone up to inevitably be sidelined. Non-whites assuming roles formerly held by Caucasians can be a delicate process, and as much thought should be put into which characters can be successfully transitioned as the consequences of sidelining a minority for a returning honky. I can't get too broken up over Ryan Choi after two years in a low selling solo series that barely connected to the greater DC Universe. 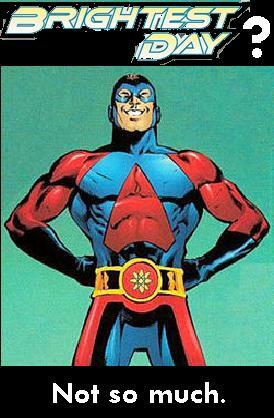 The only inherent appeal in the Atom name is in the long-lived Ray Palmer character, not in an inconsequential short term substitute. There's a lot more cause for ire in the fact that John Stewart has had to wait four years just to share a GLC title, or that the reasonably successful Jason Rusch Firestorm has been whitewashed, or that there hasn't ever been a decent original Asian hero at DC. Hey, have you ever ridden around on a frog. I think we should all refrain from rendering judgement until we try it.